Ready for a life-changing car-driving experience? You need to look at the 2018 Dodge Challenger SRT Demon. 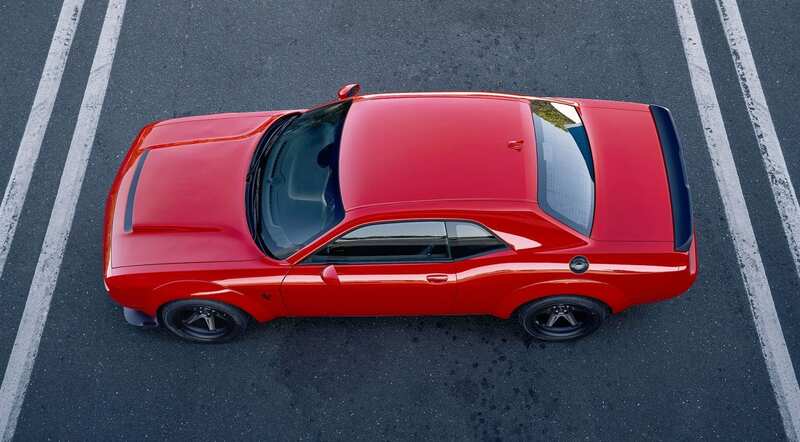 It features unmatched power in coupe muscle car form, adaptations to the strongest engine found in all of the FCA lineup, and many new features. What changes were made to the SRT Demon's engine? The SRT Demon's engine resembles that of the SRT Hellcat, but it has many improvements that allow it to best the SRT Hellcat in horsepower, torque, lap times, and acceleration. There are 25 major component upgrades that take the engine from impressive to legendary. The supercharger has been upgraded to 2.7 liters in the SRT Demon, compared to the 2.4 liters in the SRT Hellcat. The engine features a higher rpm limit-6,500 rpm versus 6,200 rpm. The SRT Demon also features two dual-stage fuel pumps as opposed to the SRT Hellcat's one. Boost pressure has risen from 11.6 psi to 14.5 psi. The SRT Demon also features more sources of intake air; gathering air from an Air-Grabber hood, an inlet near the wheel liner, and a driver-side Air-Catcher headlamp. 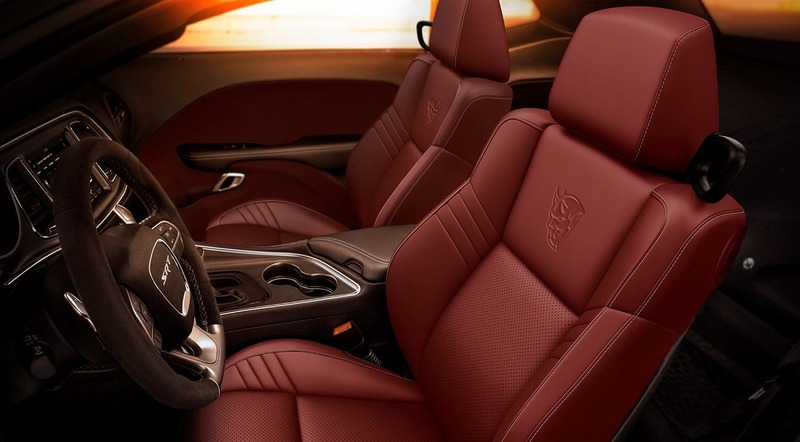 All these extra sources of air keep the intake temperature 30 degrees lower in the Demon compared to the Hellcat. How much stronger is the 2018 Dodge Challenger SRT Demon than the 2018 Dodge Challenger SRT Hellcat? The SRT Demon now sits at the top of the Challenger lineup. Until 2018, the SRT Hellcat topped the chain with the most powerful engine ever produced by FCA. The new SRT Demon is even more powerful, equipping an upgraded version of the 6.2-liter supercharged HEMI Demon V8. 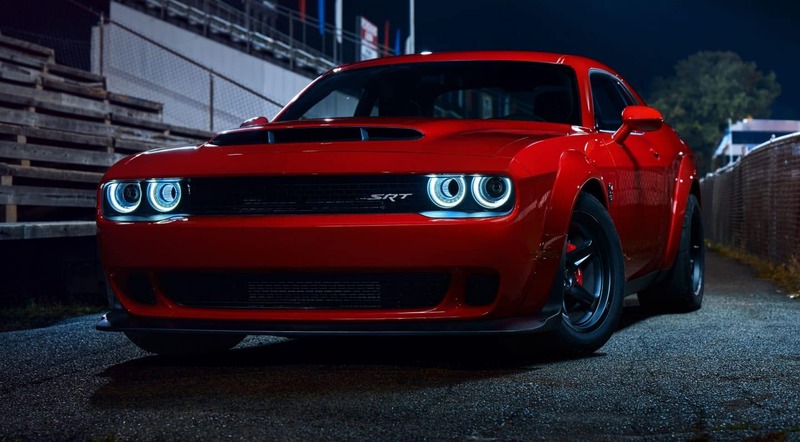 It charges the Challenger SRT Demon with 840 horsepower and 770 pound-feet of torque, compared to the SRT Hellcat's 707 horsepower and 650 pound-feet of torque. With all the updates listed above, the Dodge Challenger SRT Demon harnesses its power and tops the Hellcat in nearly every performance number. The SRT Demon sprints from 0 to 30 in one second flat, or from 0 to 60 in just 2.3 seconds. The SRT Demon also elapses a quarter-mile in under 10 seconds, coming in at 9.65 seconds and reaching 140 miles per hour. The 2018 Dodge Challenger SRT Demon also beats other competitors as well, occupying many production-car firsts. The SRT Demon is the only production-vehicle with front-wheel lift, certified by Guinness World Records and measuring a whopping 2.92 feet. The Demon harnesses more horsepower from a V8 than any other production car. It also features the highest g-force acceleration of any production car, measuring 1.8 g.
What are some of the innovative technologies found within the 2018 Dodge Challenger SRT Demon? The 2018 Dodge Challenger SRT Demon features a variety of production-car firsts, including equipment. The SRT Demon is the first to offer TransBrake, a system that locks the transmission output shaft that keeps the Demon in place before a standing start. Without overpowering the brakes, the driver can increase engine speed up to 2,350 rpm; this delivers power faster and provides 15 percent more torque at launch. Torque Reserve is also a first-time feature, prefilling the supercharger with boost and managing fuel flow to cylinders. The 2018 Dodge Challenger SRT Demon is the strongest production car with a V8 and it's making muscle car history. To learn more about this exclusive coupe, contact us today!